Meal is guaranteed if paid fully 2 days before the event date. As an IT professional, can you visualize what effective data management is supposed to look like? Can you explain to business executives and non-IT decision makers the functions of your applications, methodologies, and processes without having their eyes glaze over? What about the importance of Data Governance and where it fits within the context of your organization? If not, this presentation provides a simple, non-technical way for anyone to understand and explain the role and functions of data management as it pertains to your entire organization. Once completed, you’ll also be able to contextually show where bottlenecks and challenges may be appearing in your organization, and how simplifying your processes maybe the best way to handle your data. Provides a common language and framework. Depicts what progress looks like in all of the fundamental disciplines of Data Management. Offers a graded path to improvement, tailored to an organizational business strategies, strengths, and priorities. Dr. Sanjay Shirude has +20 years of experience in management of design, development, and deployment of enterprise data management systems. Dr. Shirude has significant expertise simplifying business IT integration by collecting and translating business requirements and objectives for application development, quality control, performance reporting, budgeting, and resource management into technical specifications and process management. As a data management expert, his technical expertise extends into data governance, business case analysis, business intelligence, SOA, and cloud computing. 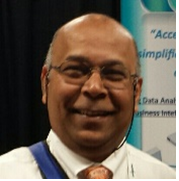 In addition, Sanjay is a contributor to DMBOK-I and DMBOK-II, and sits on the Data Management Association International (DAMA-I) board. April Chapter Meeting will be held on Tuesday APRIL 21.